Why? 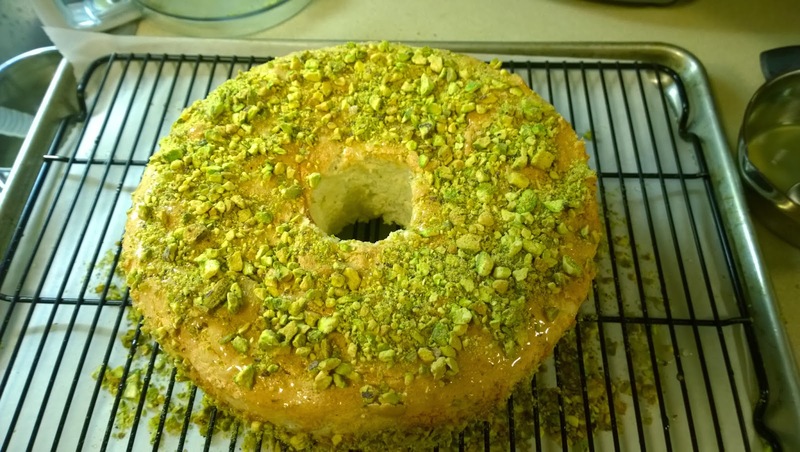 Well, it's Angel Food Cake and when angels get baked(*), good things happen. Wait, that sounds wrong. This is a Baked Recipe, so I think that sentence is okay. But in my mind, I see angels getting high...smoking the weed...or like the kids say, smoking the ganja. They say that, right? 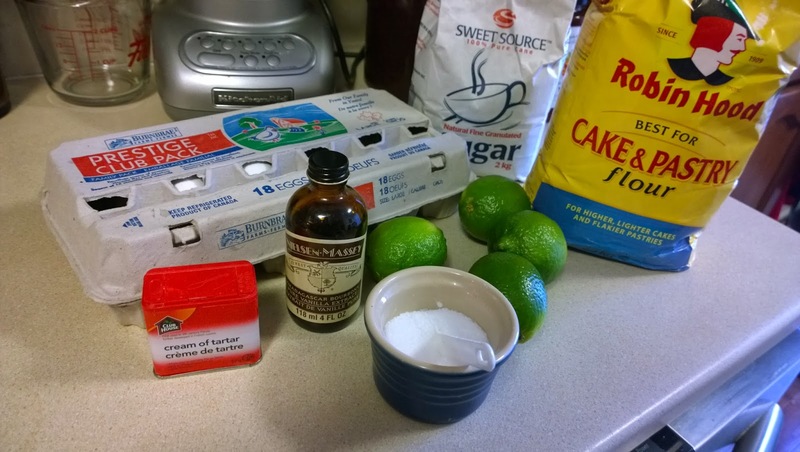 Ingredients for the cake. Check. 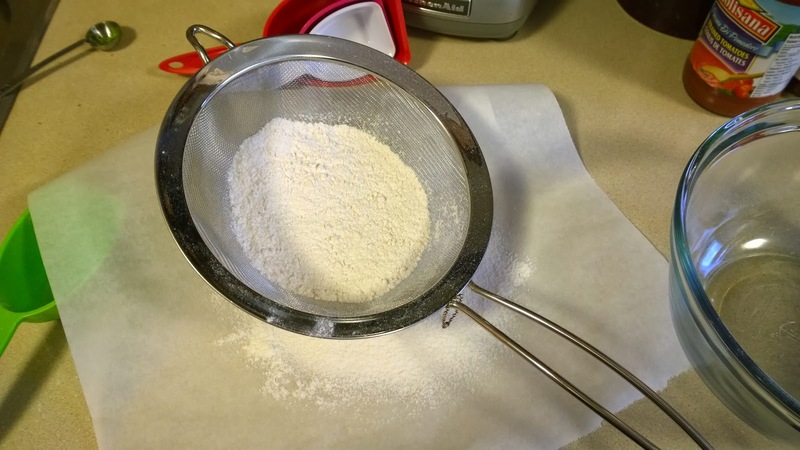 Dry ingredients get sifted...not once...not twice...but three times. No, I'm not going to start singing 'Once twice three times a lady'. No! Damn it! It's in my head now. Oh Lionel, why you wanna mess with me? I fear a catalog of Lionel's songs are going to be going through my head now. Let's just leave the sifted ingredients for now. Sifting seems to be stirring sifting up some old songs. 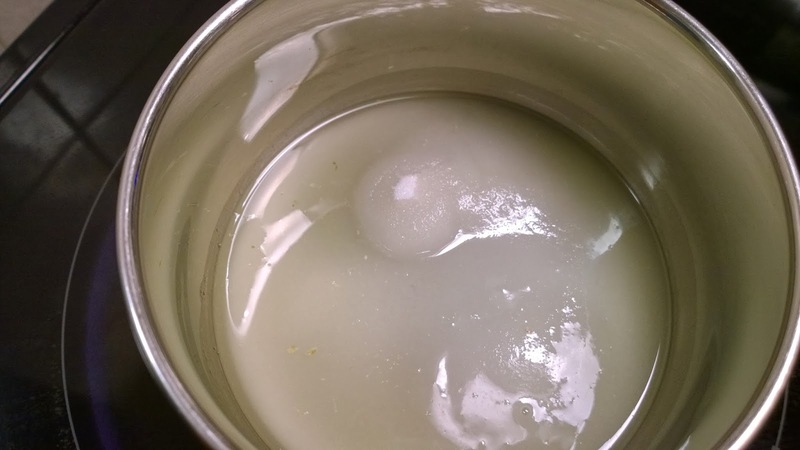 Next, the egg whites; all 10 of them (Yep, I broke a few good eggs...well, they were all good) gets combined with the lime zest and vanilla. Sugar also gets added to this mix. Batter is transferred to the baking pan. 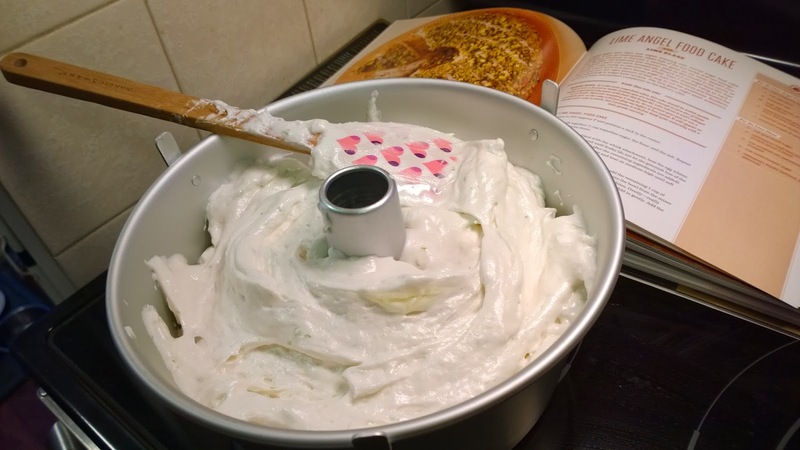 This just doesn't seem like it should work as a cake batter. 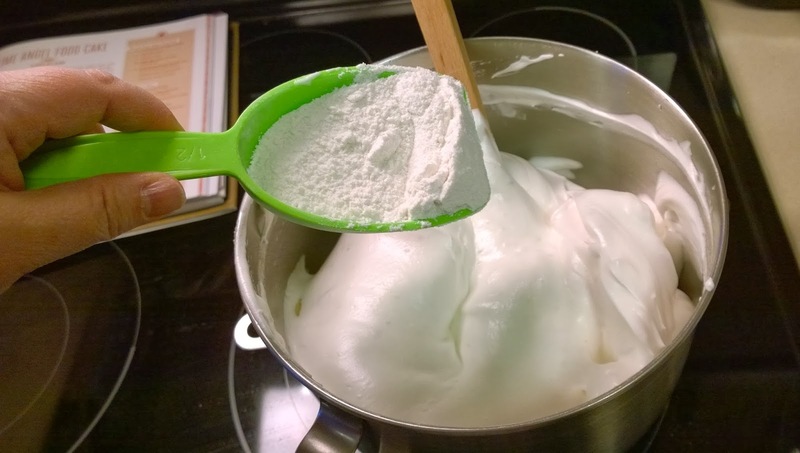 It is so light and just seems like whipped egg whites. There just can't be enough flour in here to give it structure. Now then, where is my offset spatula so that I can properly smooth the batter? Hello, is it me you're looking for? Sigh...thank you, Lionel. The pan goes into the oven for about 38 minutes. 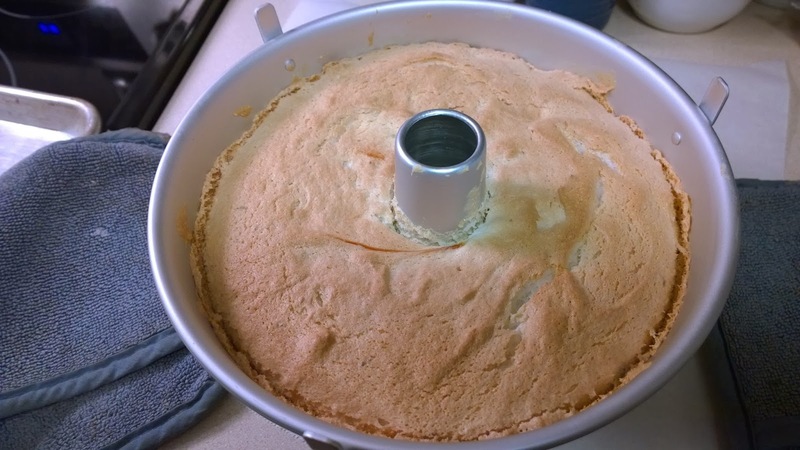 And out pops a beautifully (not sunken-thank you baking gods) angel food cake. Without too much delay, this pan gets inverted to cool. I think this is what keeps the cake from sinking. 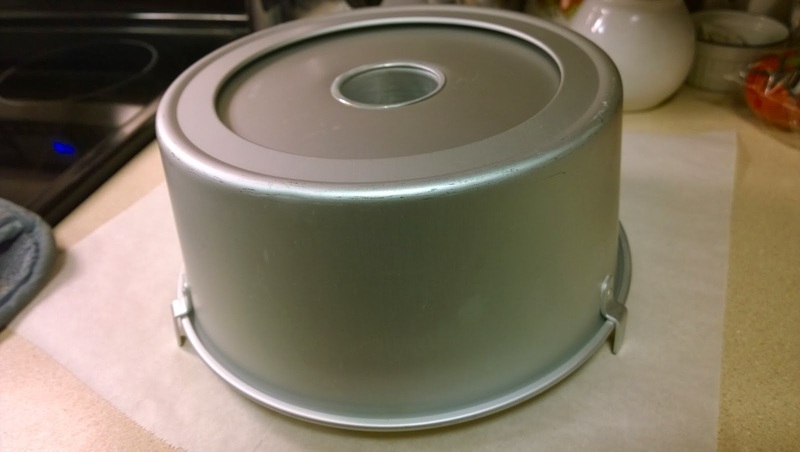 And it won't just fall out of the pan when inverted, because it is stuck to this pan (as it wasn't greased). 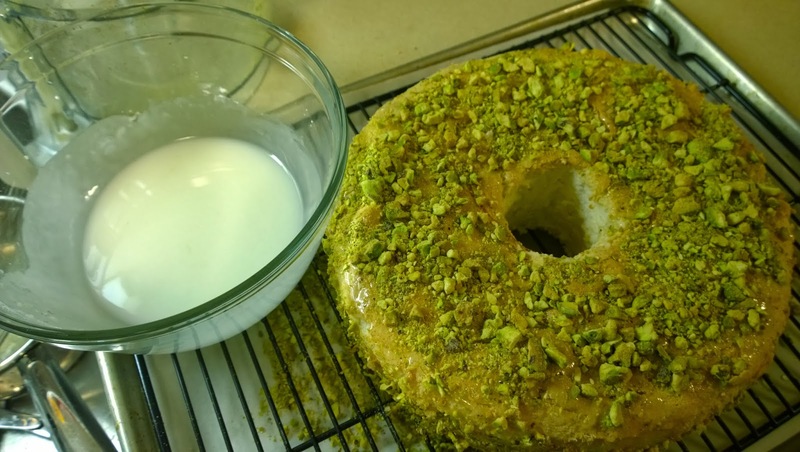 After the cake cools, the lime glaze can be made. This is a two part glaze. 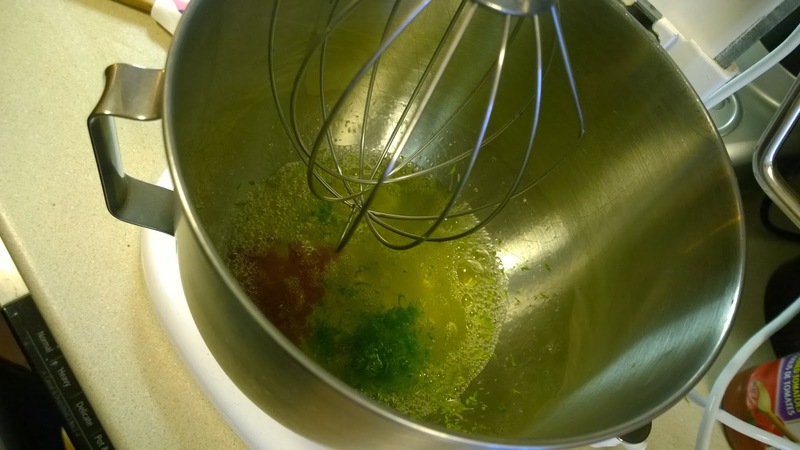 The first part, is just a little sugar and some lime juice that gets heated up until the sugar dissolves. While this is dissolving, I can crush my pistachios. 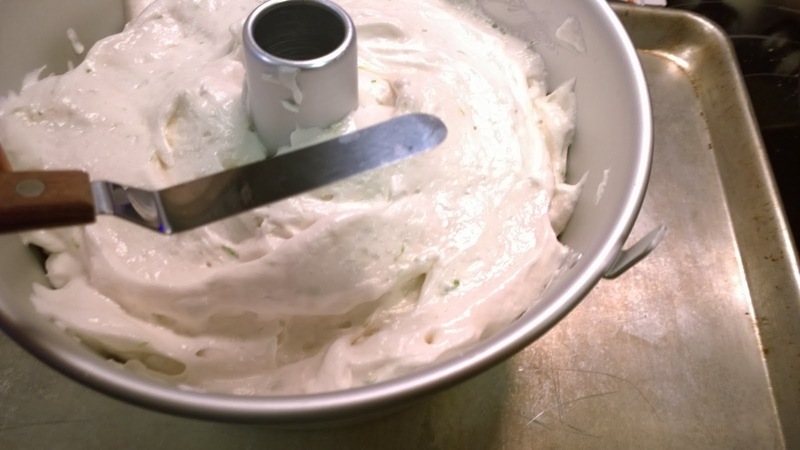 The cake, once it is removed from the pan, gets set on a wire rack which is in a lined baking sheet. This definitely helps with clean up. 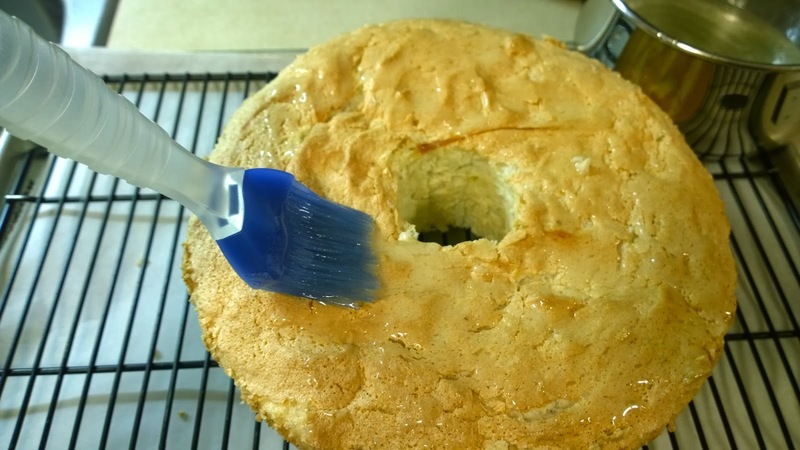 The dissolved glaze gets brushed all over the cake. Next, my crushed nuts (remember kids, baking isn't for the faint of heart) get pressed to the cake. Lastly, the second part of the glaze gets made. Yep, there's tequila in it. 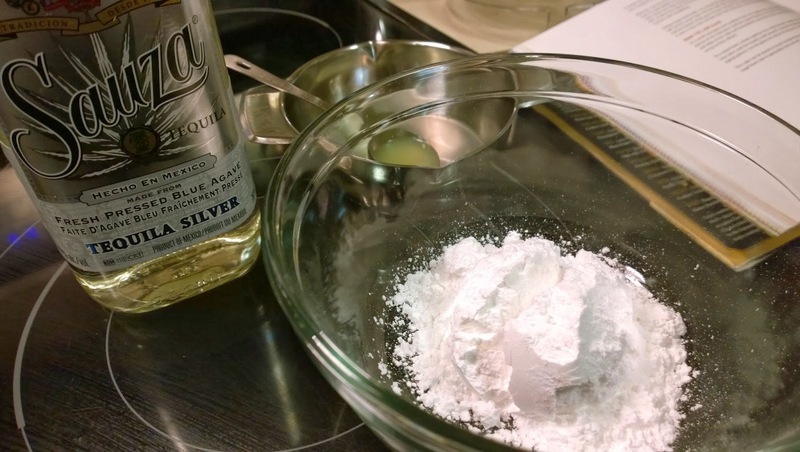 A little confectioner's sugar, a little lime juice and a little tequila. so I may have gone a little overboard with the glaze. The zigzag pattern is in there...it just isn't visible to the human eye. So far, I'm pretty darn pleased with how this cake has turned out. Pretty darn pleased indeed. So pleased, that you're 'Dancing on the ceiling'? Seriously Lionel, how is that even possible? (Oh you know what the kids would say about this.) Mmm Hmm. Say you, say me...say it always, that's the way it should be. Oh Lionel...you know I love ya. But I think I love this cake more. Gasp! Can't be helped, dude. This is seriously good stuff. This is so good, that I want to make it all again...right now! It turned out perfectly. 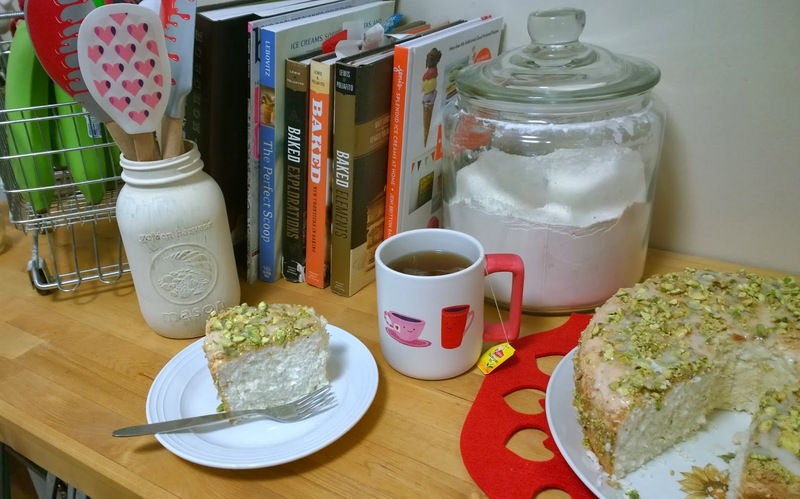 And I love the taste of the lime in this cake. That little hit of tequila in the glaze also kicks it up a notch. 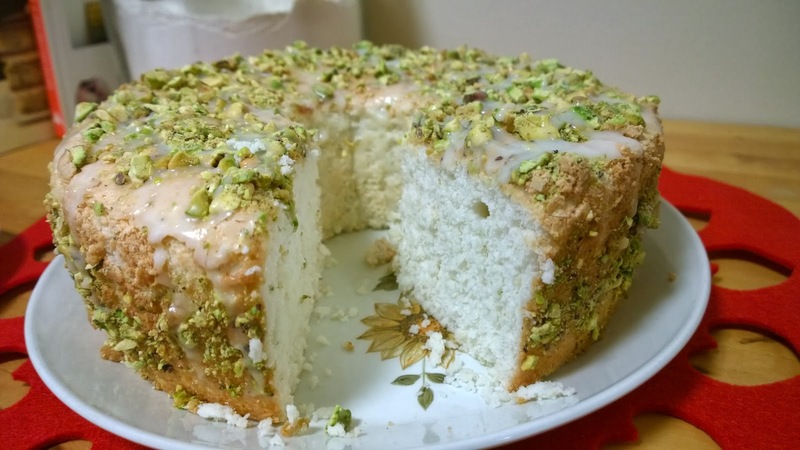 This would be a lovely light cake to serve after a heavy meal. *Please note, no angels where harmed in the making of this cake. 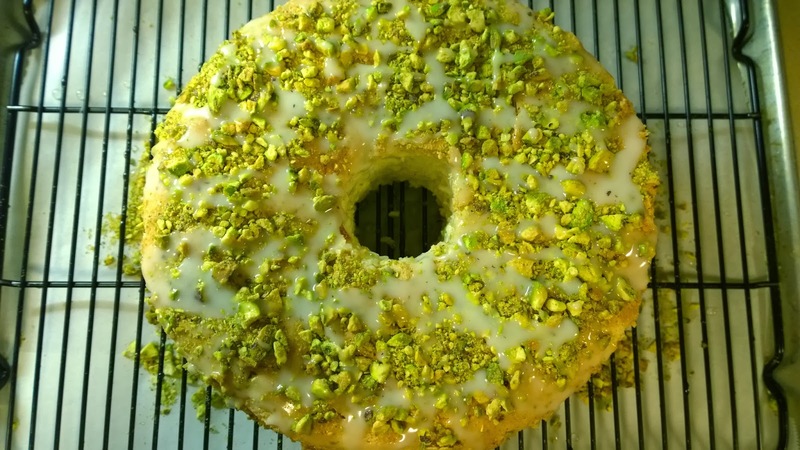 To see the recipe and how the rest of the Baked gang liked this cake, head over to Baked Sunday Mornings. Beautiful!!! Your cake look great!!! 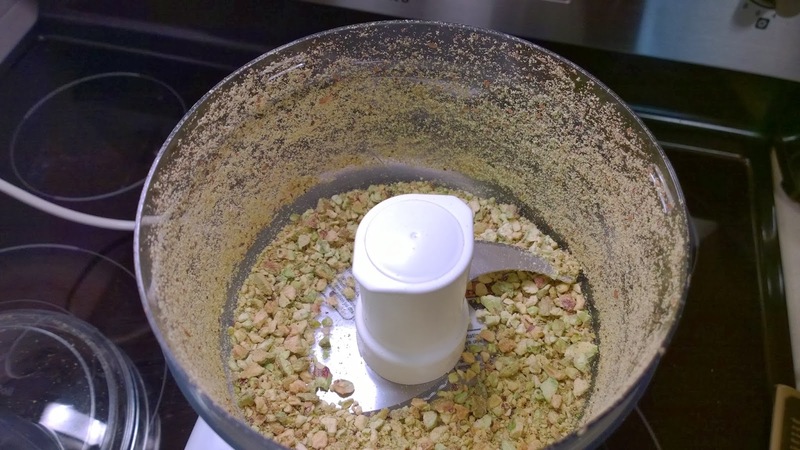 I love the lime taste too... the pistachios give a nice crunchy taste and a lovely green touch!! Totally agree, it's a great dessert to finish a meal. Wow, the cake looks amazing! Great explanations! Wow - that looks delicious! Made me all hungry - I'm making jam today and soup later too. Might have to make a cake now too... haha! Great pictures, I loved this cake too!